I’m excited to bring you another instalment of this fun and popular series. This time I presented three desk options and asked each designer to select her favourite and tell us what she’d do with it. First up, I’m happy to introduce Annie from Annie Vincent Interiors. Annie and I connected through a designer group a few months back, and I immediately took notice of her beautiful design boards. With a talented eye for design and colour, I couldn’t wait to see what she would come up with for this round of the designer challenge! Hi everyone! 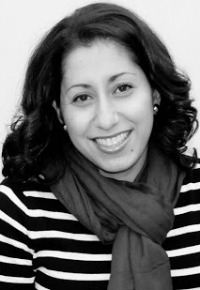 I’m Annie, an Interior Designer, wife to a wonderful husband, and mom to two kids (girl and boy). I am so happy to be apart of the Designer Challenge and hope to give you all a bit of inspiration! I was given three desk options and chose one to create a room around. First up was the Dorothy Draper Pink Desk, followed by the Anika White Laquer Desk and, finally, the LaCourte Upright Desk. Can you guess which one I chose??? 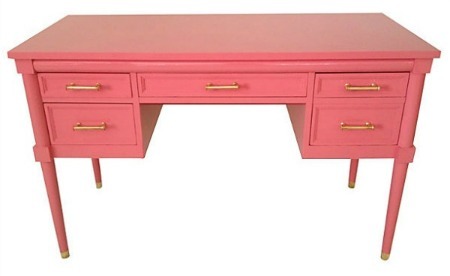 The Dorothy Draper pink desk! This is was a bit of a leap for me, but I just couldn’t resist that pink!!! Dorothy Draper was a lady known for her bold designs and risk taking. I took a risk in choosing the pink desk and I hope you enjoy the final result! For these types of challenges I like to create a story or at least have a “client” in mind. I chose my sisters, 21 and 16 years old. They both also have an affinity for horses so there is a bit of an equestrian vibe to the room as well. This room I feel could work for either one…I just might want it for myself as well! I started with the rug. I knew it had to be a bold statement to hold its own with that pink desk. I loved the high contrast, graphic pattern it brought to the room. The headboard is an update on a traditional shape made a little more luxe with some velvet and tufting. I love a comfortable headboard! I kept the bedding simple. I like a quick bed to make in the morning, don’t you? Green pompom fringe on the back pillows. Two coral ikat pillows from Zgallerie. And an iconic initial pillow from Jonathan Alder. I grounded the bed with this leopard bench. I like to have a bench or stools at the end of the bed. Even if there is room for another seating area in the room, it just completes the main focal point of the bedroom, the bed! Bedside tables is where I decided to mix things up a bit. I used the pink draper desk as a nightstand/laptop desk/vanity area. Add a ghost chair, mirror, lamp, and a cute saying or photo you love and ta-da! For the other side I picked a favourite nightstand. Added a sculptural lamp, (add some books to give it additional height to balance out the lamp on the opposite desk) and a stallion. Brought in the same colours we have been using over to the seating area. A touch of gold in the curtain hardware. And also in the floor lamp. Some more stripes with coral and white curtains. And finally this fabulous kelly green trellis chair! The paint colour I chose was Benjamin Moore Classic Gray. Gray comes alive with bright fun colours! Topped it all off with this beautiful chandelier! Psst… it is a great look a like version to a much pricier version! Thank you, Annie! This bedroom design is gorgeous! I love how preppy and fresh it looks, and I can imagine how much one of you sisters would enjoy spending time there (or any girl for that matter)! How about you? 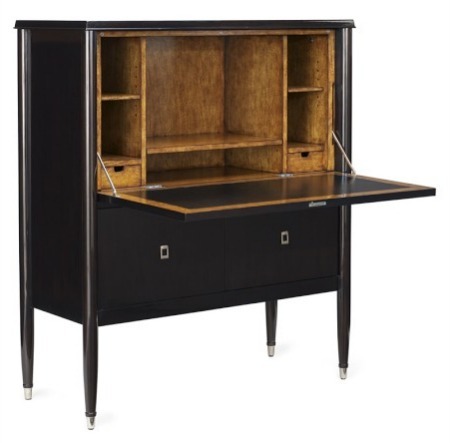 Would you select the Dorothy Draper desk as well or one of the other options? What kind of space would you design around it? Come back tomorrow to see which desk Tazim of Love Snap Make selected and what she did with it! The same desk I would choose as well. Love the unexpected color combination of Annie’s room! The color palette is a bit palm beach preppy, with a little edge thrown in. Love it too! What fun! 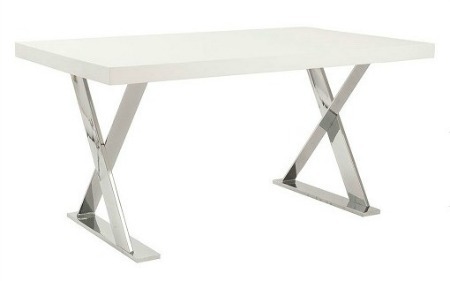 I love the desk and would have picked it too… Mixing in that green is Palm Beach Pretty!! That palm beach style is very very pretty. 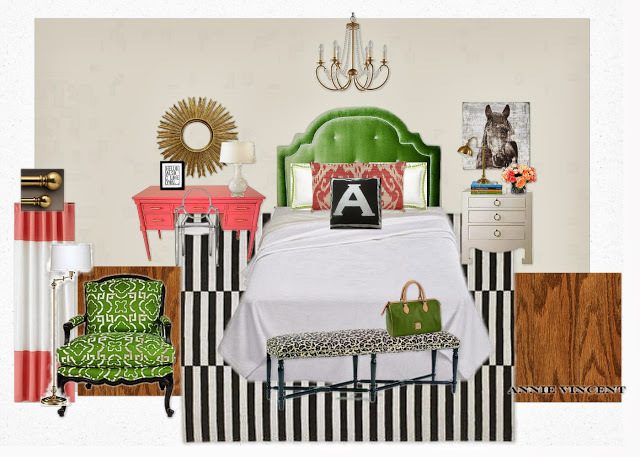 Oh that looks like fun and I think that room came together very well – great job Annie!! Yes, the Dorothy Draper all the way! In fact, when I saw the desk, I gasped out loud! It’s a show-stopper for sure! Hey, that is the desk I chose too! Very fun. Love the colours she worked with – very glamourous and fun at the same time. Thanks everyone for the warm responses! I really enjoyed the challenge and I am grateful to Shauna for the opportunity!